The economy is booming but the Trump base is taking a hit. GM is shutting down Chevy Cruze production at its 6 million square foot Lordstown plant. And Reason says the billion dollar cost of steel and other tariffs might have something to do with it. 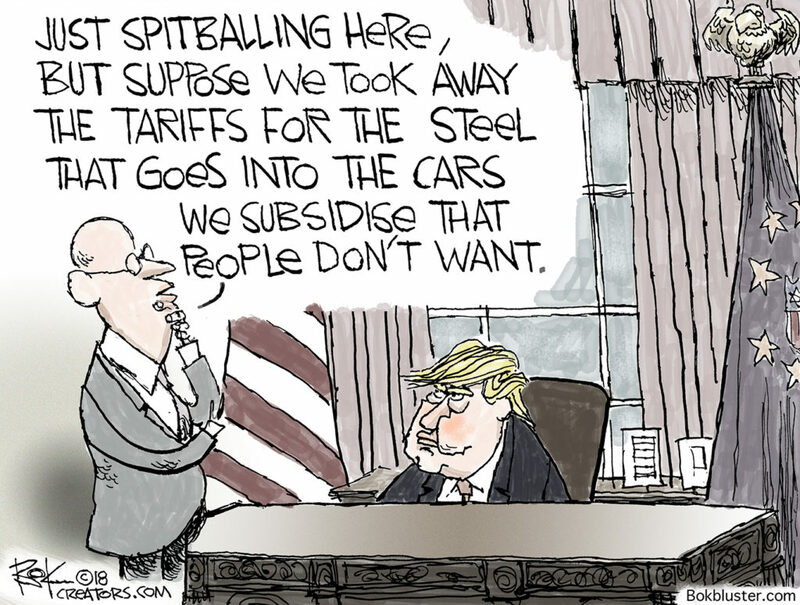 Steel workers are an important part of the Trump base. So are autoworkers and 1400 of them are about to lose their jobs. “The U.S. saved General Motors, and this is the THANKS we get!,” tweets Trump. Electric cars too. NPR reports the government subsidies electric cars to the tune of a $7,500 tax credit for buyers. So now GM will focus on what it’s good at. In Mexico. 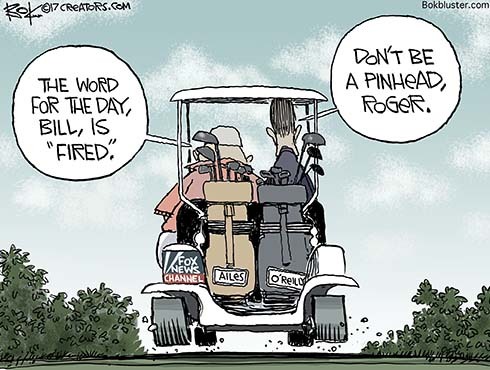 Bill O’Reilly joined Roger Ailes in enforced retirement on Wednesday. Both were accused of sexual harassment. Not to worry though. CNN Money says O’Reilly’s golden parachute falls just a little south of the $25 million contract he recently signed. That compares to his former boss’s $40 million bail out. 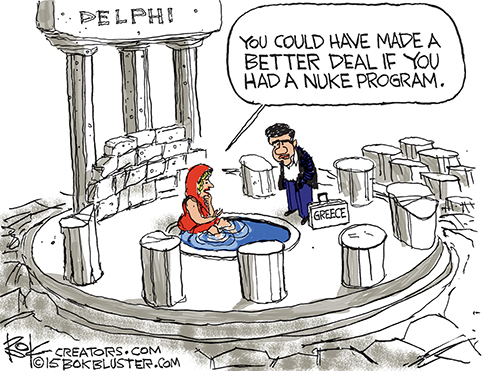 Also, there’s a trickle down payout effect. The NYT says O’Reilly and Fox paid about $13 million to various women who accused him of sexual harassment. He admits nothing. Still, Fox gave him the boot. 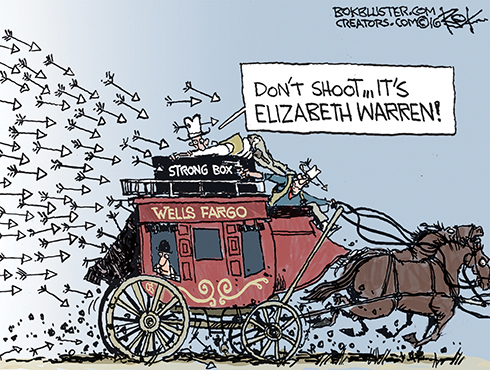 Wells Fargo CEO John Stumpf resigned on Wednesday and Elizabeth Warren finally got the scalp she wanted. Bank employees opened about two million unauthorized customer accounts on Chairman Stumpf’s watch. The scam led to bonuses for the employees and extra fees and overdraft charges for the unsuspecting customers. Stumpf will get no severance package and he has forfeited $41 million in unvested equity. Also, the bank has fired 5,300 employees and agreed to pay a $185 million dollar fine. Additionally the former CEO will be tied down naked in the desert over a termite hill. I made up that last one. Stumpf’s not exactly losing the shirt off his back. He earned about $120 million during his career at Wells Fargo. Our colleague Dennis Berman reports that in nine years he produced some $149 billion in profits and saw an increase in market cap of $124 billion. Wells Fargo tried to turn down the government’s rescue funds during the 2008 financial panic because it didn’t need the help, only to be forced by Treasury to take the money. January 28, 2016 2016 presidential campaign, 2016 presidential campaign, bailout, banking, Clinton, Economy, Politics, Trump, Wall St.
Hillary got $675,000 in speaking fees from Goldman Sachs. As any Clintonian would say, that’s old news. We expect it. 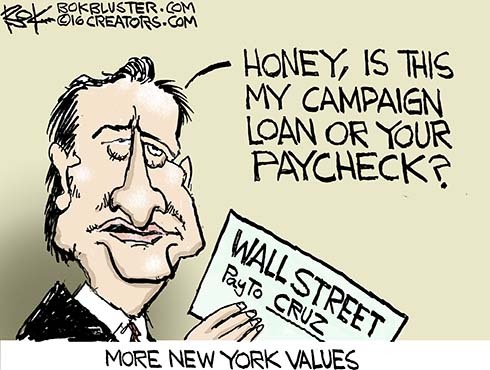 Ted Cruz failed to properly report a half million dollar loan from Goldman Sachs. The news here isn’t that he forgot to report the loan, it’s that the Wall Street bank lends him money. Not only that, his wife works there. At least she did until she took a recent leave of absence. Ted Cruz is a smart Princeton and Harvard guy. He’s undeniably conservative and has the courage of his convictions to stand up to the ethanol lobby in Iowa. But neither a borrower or a lender be when you’re trashing New York values.